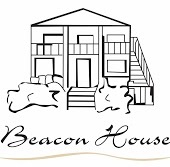 How Can I Go Beacon House Inn Bed & Breakfast? Where is Beacon House Inn Bed & Breakfast in Carolina Beach on the Map? This location has 30 reviews from customers. Our stay at the Beacon House was nothing short of absolutely amazing. This was my and my husband's first experience with a B&B and I could not possibly be happier that it was with Mike and Heather! They are so passionate about what they do in the hospitality industry and it shows 100%. Mike, my husband, and I could easily have talked for days about our love of cooking! Jeanne also cooks in the mornings with Mike and she was fantastic--so friendly and accommodating! The breakfasts were wonderful and I left there feeling so inspired for what I would make at home. Totally redefined my go-to ideas for weekend breakfasts. The inn is quiet, lovely, and a perfect short stroll to the beach. We stayed in the Traveler room and it was a very cozy room at the back of the house. The bed had a super fluffy comforter at the foot of it which literally became my best friend since my husband likes to keep the room so chilly at night. I also really liked that we had access to a communal fridge in the upstairs hallway where we were able to store our fruits and water bottles. We may have accidentally left some ice packs in the freezer section, but I guess those can just be a surprise for another guest! :) I absolutely plan to stay with Mike and Heather every time we visit Carolina Beach from now on. There is no other place I would rather be. Was very impressed with the innkeepers ability to cater to our diet restrictions. They made us feel very at home and were incredibly accommodating to our food preferences. Probably the best part of our entire weekend getaway was breakfast in this beautiful home with these lovely folks. Thank you Heather and Jim! We had an awesome time at this bed and breakfast for our first trip to Carolina Beach. It was the off season so it was quiet and low-key. The bed was soft and comfortable, the whirpool was great, the hosts were friendly and helpful, and the breakfast was yummy. We had access to snacks, a refrigerator, and a list of nearby restaurants to choose from. The beach is right across the street. We had a great time and made wonderful memories. This was our second beach trip to the Beacon. The inn is impeccable with interesting architecture; the breakfast is worthy of its own food network show; the owners are incredibly friendly and knowledgeable. It's a short 2 minute walk to the beach - so convenient. We have really enjoyed both of our visits and plan to return again next year ! Great get-away. This B&B is everything we were looking for to get a few days away from the grind. The rooms are nothing spectacular but the breakfasts are excellent and follow their philosophy of "nothing from a box". The location is great for a quiet day at the beach that's close enough to all the amenities of a beach town with the advantages of being fairly close to the city of Wilmington. We will definitely return!